Padron peppers – These are a Spanish specialty pepper, all the rage in foodie restaurants. NOTE: About 1 in 10 are spicy! The rest are mild. The traditional preparation is: hot pan, hot oil, sear for ~2 minutes, add coarse salt, and serve. They are typically an appetizer or drinking snack. Make sure you have something cooling to drink in case you get one of the really hot ones! It’s the Russian roulette of peppers. Japanese eggplant – In my opinion the asian eggplants are easier to work with than the big globe eggplant. Their skins and interior are typically softer. Try slicing into 1/4-1/2″ slices and stir frying. You can also grill these – cut in half lengthwise. Before cooking you can salt them for 15-20 minutes if you want, though it’s not necessary in my opinion. Romano beans – These are big, meaty Italian green beans. They can be prepared any way you would a green bean, though be aware they make take slightly longer to cook through. They are very versatile – boil, steam, saute, braise, you name it! Sweet onions “Walla Walla” – I can’t get enough of these sweet onions. I love them raw on sandwiches or atop breakfast eggs with tomato. Rounding out the share are the familiar carrots, zucchini (some of you got patty pan summer squash as well), “rainbow lacinato” kale, various cucumbers, 1 tomato, and 1 head of lettuce (some of you got romaine and some red leaf). The summer squash/zucchini, cucumbers, tomatoes, and a few other crops will usually keep producing throughout the duration of the warm weather. Some of you may find that you tire of eating some of these same items week to week. Remember that CSA means eating seasonally based on what grows well in your local climate at that time. 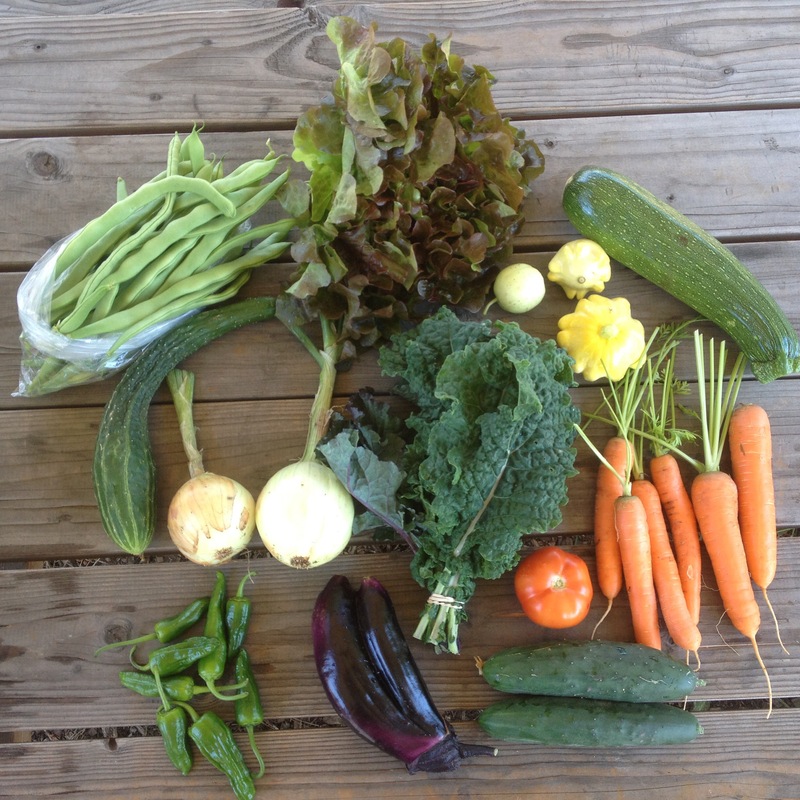 These items have to be harvested each week in order to keep them productive for the duration of the season. If you find yourself building up zucchini or something else in your fridge, challenge yourself to find new ways to use it. For example, with zucchini, try shredding and making fritters or my favorite way: grill it!